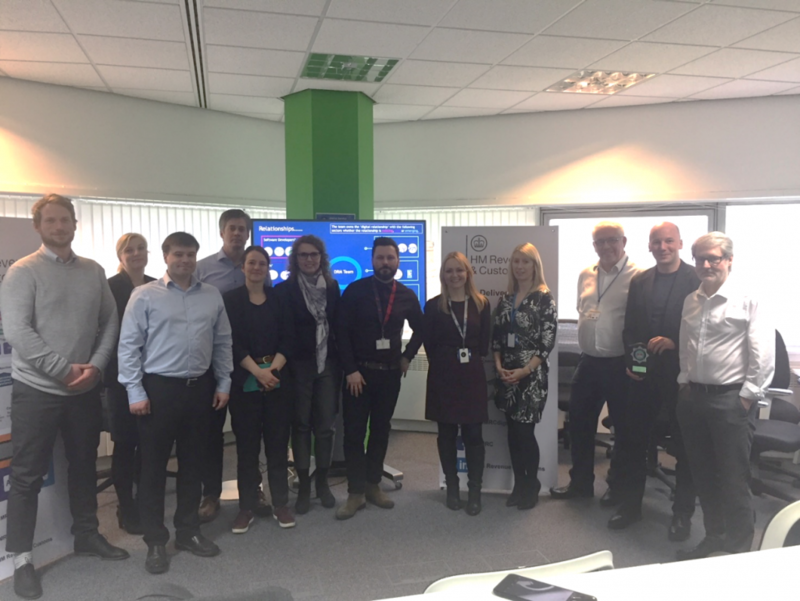 A delegation from the Danish Tax Administration recently visited the Digital Delivery Centre in Shipley for an exchange on digital transformation. Ronnie Nielsen, Chief Adviser with the Danish Tax Administration reflects on the experience. The opportunity to spend two full days with UK colleagues at the Digital Delivery Centre in Shipley was a powerful reminder that these are exciting times for tax administrations. Some of the things that stood out were the strategic approach to digital transformation; the different role of third parties in providing digital services; and the talent and enthusiasm of the people we met. It was also quite humbling (and a source of envy) to get a glimpse of a digital operation comparable in size to many smaller tax administrations. One of the privileges that come with size is that you can afford to think more deeply about where you want to be and what it takes to get there. I remember how the audience at an Organisation for Economic Co-operation and Development (OECD) meeting on digital services five or six years ago went silent when Brigid McBride, digital director at the time, presented HMRC’s digital strategy and implementation roadmap. This changed the conversation in the room from one about isolated tactical activities (say the improvement of a website or the delivery of an app) to one about a comprehensive effort to transform business processes and service experiences. Some of the components of HMRC’s strategy that I personally find most inspiring and forward-looking are the API Strategy and ‘API First’ principle. The theme of strengthening the broader 'tax ecosystem' is a recurring one in international conversations, but also one where practices have yet to catch up with intentions. With HMRC’s deliberate bet on APIs, you’re leading the way in building bridges to this ecosystem, which allows you both to leverage the innovative capability of the market and potentially improve the processes that impact on compliance outcomes, for instance for the large segment of small businesses. There is also great merit in the idea of building services as flexible components that can be recycled for different purposes. Many tax administrations will be looking to learn from your experience with everything from the technical setup over governance and collaboration with third parties to the actual use-cases – such as nudging businesses into compliance (and facilitating the role of accountants) by exposing some of the least sensitive risk flags in third party systems. A striking difference between Denmark and the UK that became apparent in this discussion is the size of the market for tax-related services. We have traditionally relied on third parties mainly as providers of data while reserving for ourselves the role of building the actual interfaces to taxpayers. It seems that the situation is quite different in the UK with a more mature market (for instance for bookkeeping software directed at small businesses) and a much bigger role for third parties in providing services or facilitating compliance. This makes you something of a lead user in thinking about ways of strengthening and leveraging this tax ecosystem. Another area where you may be something of a lead user is in voice recognition and natural language processing where the maturity of the technology are quite different in the UK. This can be illustrated by way of an anecdote, although perhaps an embarrassing one. In December, I was asked to give feedback to a vision document on future customer interaction, which included a section on how customers would engage with us by speaking to digital assistants in their homes. I was quite dismissive of this idea, which in the context I saw as a bit of a distraction from more urgent priorities, and argued that there was no apparent market for this form of interaction. Watching Ollie, Sonam and Gabriel from the HMRC Model Office demo a prototype of how a taxpayer could interact with the HMRC using Alexa made me completely change my mind. The maturity of voice recognition (and as a consequence the market penetration of digital assistants) may be different in the UK, but actually experiencing the voice-enabled interaction made it very tangible how this technology is going to impact expectations and service interactions. This provided a glimpse of a future that may not be that far away. It is thought-provoking that the next generation may grow up wondering how it ever made sense to interface with technology using keyboards – and we need to constantly remind ourselves to be perceptive to these changes and their significance. During the exchange, I was asked to make a presentation on our digital strategy, which put me in an odd situation, as the truth is that we don’t really have one. Even in the absence of a strategy, however, there is a clear direction of travel. We have incrementally been building a robust process for personal income taxes based on withholding at source and use of third-party data to pre-populate tax returns, which has generated a 'compliance by default' situation for most individuals with simple tax affairs. Almost two decades of whole-of-government digitalisation drives has made digital filing mandatory for businesses and left us with important digital infrastructure like a shared public-private login procedure, a digital mailbox and a public income register. In recent years, we have also invested substantially in new digital capabilities and started developing pointers for future digital services. The two days enjoying the hospitality of UK colleagues in Shipley left us with a much better understanding of the HMRC digital operation than we could have obtained from any document. It also provided a welcome mirror that allowed us see more clearly some aspects of our own practices, assumptions and aspirations. We are thankful for this opportunity and hope to continue the conversation, as our administrations travel towards exciting future destinations.